You can still treat yourself! These dessert recipes will give you the sweetness you crave with none of the guilt! 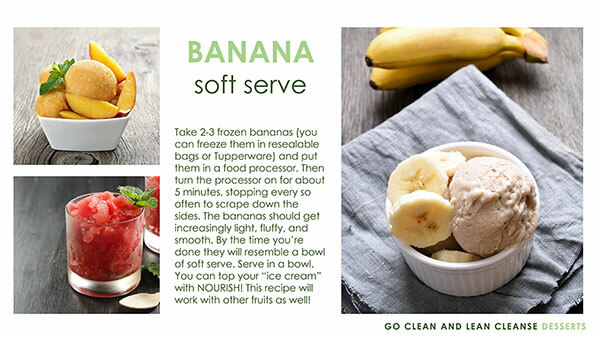 Take 2-3 frozen bananas (you can freeze them in resealable bags or Tupperware) and put them in a food processor. Then turn the processor on for about 5 minutes, stopping every so often to scrape down the sides. The bananas should get increasingly light, fluffy, and smooth. By the time you're done they will resemble a bowl of soft serve. Serve in a bowl. 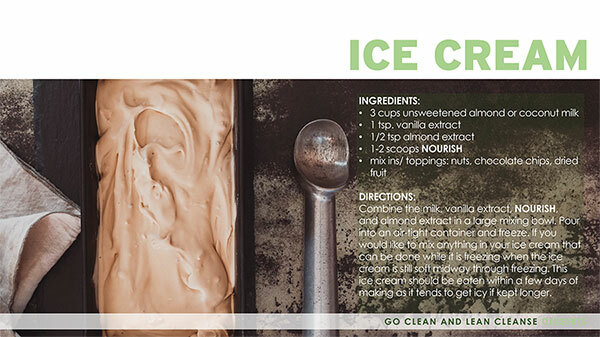 You can top your "ice cream" with NOURISH! This recipe will work with other fruits as well! Melt coconut oil in a bowl of a double boiler. Remove from heat and whisk in cacao powder, HBN PRODUCT, honey/ maple syrup to taste, and extract until thickened. Pour into ice cube trays or spoon onto parchment paper. 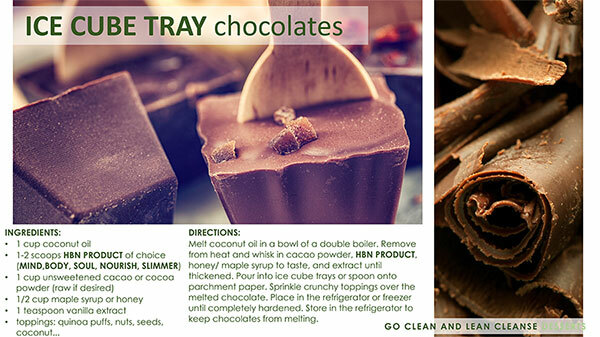 Sprinkle crunchy toppings over the melted chocolate. Place in the refrigerator or freezer until completely hardened. Store in the refrigerator to keep chocolates from melting. You can use any kind of fruit you would like for this recipe. Just be sure to prep your fruit (wash, cut, peel, add a popsicle stick for easy dipping) before making the chocolate so that you can dip the fruit while the chocolate is still warm. You can buy organic/ minimally processed chocolate at the store and heat in a double boiler or use the ICE CUBE TRAY CHOCOLATE recipe. Once your chocolate is melted, dip your fruit in the chocolate and place on a pan lined with parchment paper. 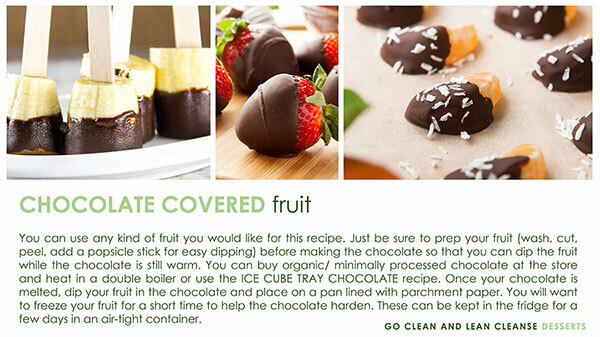 You will want to freeze your fruit for a short time to help the chocolate harden. These can be kept in the fridge for a few days in an air-tight container. Combine the milk, vanilla extract, NOURISH, and almond extract in a large mixing bowl. Pour into an air-tight container and freeze. If you would like to mix anything in your ice cream that can be done while it is freezing when the ice cream is still soft midway through freezing. This ice cream should be eaten within a few days of making as it tends to get icy if kept longer.